The only thing I did 3 weeks ago was watch a store-bought dvd; dvd was a dvd with episodes on it and while I was watching the 1st episode (there were 4 on the dvd) I had NO problem during watching it, until the end of the episode, couldn't do anything with the machine. The only thing that actually works is the open/close button. I have tried to use the following dvds: a finalized dvd that I made from the machine, an existing dvd that hasn't been finalized yet, dvd cleaner, store bought dvd. EVERY ONE was not recognized; I get either "no disc" or nothing on the display. Now my question is ths: is there any way that I can remove the existing dvd and replace it with another one? Where would I buy the replacement part? I can't buy it on JVC's website nor has JVC been any help since JVC refused to acknowledge that this can be done outside of sending it to Georgia. I really don't want to buy another vcr/dvd w/hard drive. I've never tried to replace the JVC drive. It is an OptiArc that I recall from when I last opened it up some years ago. To be honest, I've never played a music cd on the machine in all the years I've had it and I've literally used it EVERY single day since the day I got it; in fact it's never occured me to play a music cd. Unfortunately, at the moment I'm dubbing (hard drive to vcr) so I'll have to try that tomorrow. I 2nd what lordsmurf said about the audio disc. I have a very old Panasonic DMR-HS2 with a stuffed disc drive - same errors as yours but it does still play audio cds. I do not know if they are willing to sell to a private party, price seems a bit high. Unplug it for a minute & plug it back in. Also, often you have to clean dvd players by opening them up. Cleaning disks either do dust or oil & perhaps you didn't use the one that can get your laser clean? I have unpluged and repluged it in too many times to no avail. I even unpluged it for a few days and nothing changed. I have taken the top cover off but I'm clueless how to clean the darn thing; all I see is a big square that's near the hard drive on the right side of the machine. I also went onto that JVC website to look at parts. They do have a "DVD Drive Kit" for about $150 but when I clicked on it the description told me nothing. I kinda expect a description or something. When I opened my machine, the name on the dvd recorder says Hitachi of which I did go searching for that particular model but again, I'm clueless if I would be buying the right one or not and how to install it. I also want to thank those of you that responded to my quest for help! Does JVC offer a set rate to correct it if you mail it in? I know Panasonic does. I don't think they have a set rate. They repaired my DR-M100 for about $300.00. I think about $140 of that was for labor. ($70/hr if I recall). I have my invoice somewhere, I'll check it when I get home. Yes and no. They did say it would cost $65 for the technician to even look at. After that it would depend on what the technician finds or doesn't find. So it would cost me shipping (safest way possible) to Georgia and a minimum of $65. Did you have to send your machine to Georgia? That's the only place they said I could send it to. Others will strongly disagree with me, but I have to say "let it go", there is nothing practical you can do to save this machine. It is nothing short of Guinness-world-record, oh-my-GOD-I'm alerting the media, miraculous that you have gotten four and a half years use from a JVC model with hard drive. They are just notoriously, egregiously unreliable units that are virtually impossible to repair: when new, JVC could not even repair them under warranty, they just gave out new machines. If you've ever wondered why JVC completely stopped consumer marketing of their HDD units after 2004, that was why. JVC service will not promise in writing to repair your unit because they know already that they can't, they're hoping its a simple fuse or something that they can turn around and bill you $300 for. The repair fees to actually get this model working far outweigh its usefulness: if you can afford to throw away the cost of an entire new DVD/HDD recorder on a roll of the dice, its your call, but if money is an issue, don't do it. All JVCs have had minor teething issues, like many other brands sold around the same time. But the JVCs with hard drive are a genetic mutation that splits completely away from the legendary DRM-100 or DRM-V5. JVC did some very strange component matching in the hard drive models between motherboard, burner and hard drive, all in the name of copyright control. If any one of these three subsystems wears out, the entire recorder becomes a doorstop because JVC neglected to include a system to "retrofit" possible replacement parts. Repairing a JVC "MX" HDD model is for all practical purposes impossible. If you're willing to gamble a great deal of money, JVC will try, but chances for success are slim. Do not under any circumstances allow anyone but JVC factory mail in service to touch your recorder, they are the only ones with the faintest idea how to repair it, if it is deemed possible. My advice on this specific model should not be taken as JVC bashing: I own a JVC DRM100 and (2) DRMV5s that I am quite pleased with. But every mfr has launched a turkey or two, for JVC it was the hard drive MX models. A broken one is not easily fixed at reasonable cost, think twice. I give the same warnings about Pioneer hard drive models made the same year: they have inherently flawed engineering that makes repairs impossible. That doesn't mean every Pioneer is a bad risk, just that model. DVD/HDD recorders are no different than cars, cameras or blenders: every mfr has a lemon in their closet..
Darn it! I was really and truly hoping someone wasn't going to mention that to me - throw away my machine. The hard drive is actually my all time fav part of the machine; absolutely LOVE it!!!!!!!! I am EXTREMELY spoiled by having it. Can't even imagine taping something from the tv and putting it on a dvd without the hard drive to do my editing out commercials. All I want is to replace the blasted (sorry only word I can think of that represents my feeling right now) dvd part. I'll have to make a decision about sending it to Georgia then. Unless you have some priceless material trapped on its hard drive, it may be best to let it go, four and a half years is actually 6-18 months above the average DVD/HDD recorder lifespan, and fantastic durability for a JVC-MX model. You really did get full value from the unit, that is the bright side. Be sure to consider the alternatives before spending money for a repair estimate: it could cost $40-80 round trip postage + a minimum estimate fee from JVC ($50? ), just to tell you nothing can be done or the service fee is $275. Right now, for $249, you can order a brand new Magnavox H2160 from Wal*Mart online. This unit has a reliable ATSC tuner which will be good to have after the digital TV switchover in June. It has a 160 GB hard drive and a decent burner compatible with more brands of media. Its hard drive is easily replaced and its burner is fairly commonplace and should be fixable down the line. Picture quality is very close to your JVC up to the 2.5 hour speed, at the 4 hour speed its not as good but really nothing after the 2005 JVCs were good at 4 hr anyway. It has an HDMI connection for newer TVs which can upconvert. And it can record full 16:9 widescreen broadcasts from its digital tuner, which would look much better than any 4:3 letterboxed material from the JVC. I think you're better off with a new Magnavox than trying to repair the old warhorse, and this H2160 is likely the last DVD/hard drive recorder we'll see in the USA so nows the time to buy. As a class, DVD recorders are understood to be disposable products: very few are worth repairing or possible to repair. Here and there you can replace hard drives but the burners are hopelessly proprietary and tough to fix/replace at reasonable cost. Kind of like how the replacement airbag for a 2000 Toyota Camry costs more than the entire car is worth: you're better off replacing the car. If I were you I'd seriously look at the Magnavox 2160 w/HDD. It seems to only be available at Wal-mart.com but for the reasonable price of ~$250. It will NOT be of the build quality of your JVC but most everyone who orders one is quite satisfied. Besides it's about the only NEW DVDR with a HDD available in the US. It has the bonus of a digital tuner if that interests you and I'd think money spent on it would be better than money spent on your JVC, Just a thought. The JVC is worth repairing. If it's broken! Answer my question about the audio CD, I'm troubleshooting for you. If LordSmurf can assist you in a low-cost "home remedy", its certainly worth pursuing: if anyone can help you with that its him for sure. I should clarify, my advice to ditch the unit is from the "value/performance economics" approach, as it applies to a typical consumer. LordSmurf is a professional tape-to-DVD video transfer specialist who prizes his vintage JVC recorders above rubies because of certain image qualities he can't get with other recorders. These qualities may or may not be as important to you, especially if you've already finished transferring your VHS to DVD and primarily use the recorder for broadcasts now. The JVCs from the same model series as yours that didn't have hard drives are easier to manage: when their burners go, you toss them and buy another working JVC recorder second hand (if you must have the JVC 2004-2005 image filters). Many of us have done exactly that, a good used JVC can be easily found for $50-75 and lasts a couple years under killer heavy use. But never would I fork over $hundreds$ to repair one, not unless my livelihood depended on it and the repair paid for itself (as in LordSmurfs case). That goes double for the misbegotten MX series. If the specific 2004-5 JVC image filters are not crucial to your use, you can buy much better hard drive recorders, used or new, for less than the cost of repairing the MX. Or, buy a used non-HDD JVC DRM-100 or DR-MV5 for $50-100 and just edit the DVD recordings on a PC. The terrible engineering decisions in the JVC hard drive models are not found in the non-HDD models. Its worth noting that none of these mfrs, except perhaps Panasonic, still makes anything now thats remotely similar to their recorders of 2004-2005, nor are they prepared to repair the old models. JVC and Sony in particular have not marketed "quality" recorders in years: Sony has stopped stocking repair parts altogether and JVC is not really set up to support anything other than their current made-by-LG items. Again, if the specific machine is priceless to you for a very good reason, and you can write off a $300 repair tab, and risk that JVC service may not even know what the hell they're doing, fine. Otherwise, replace your MX with another recorder, new or used, JVC or not. There are no trustworthy guarantees of proper DVD recorder repair with any brand anymore, except for Panasonics flat-fee $130 program, and to get that is like pulling teeth. I would take my chances with a used recorder first. I would only pursue "home remedy" methods for sure. Paying JVC would rank low on my solutions chart, too. The last time I had a device repaired, a valuable Panasonic ES10, it was done by the A/V guy at the local community college, because he charged only $25, needed $5 in parts, and fixed it perfectly. Panasonic would have asked for at least double that just to look at it, ridiculous! I guess I would value the JVC above rubies. Pretty rocks don't help much with video conversion. Rich or poor, the videos have to be converted! All to pften someone asks for help and than refuse or simply not respond . You wrote 5 posts after the question was asked. Hi Everyone! Sorry for not responding to any of you who have offered to help me in the past few days. I've been away since Tuesday. I'll be reading and trying whatever is written today. Again, I'm not ignoring your help but I wanted to explain first. Hi Everyone! Ok, I just put a cd in the player and it works. Now, if I can play a CD, how come I can't play a DVD? That's makes NO sense to me. CD/DVD, it's put in the same place, how can one play but not the other?????? Because the unit has 2 lasers - 1 for CD and 1 for DVD. I have 3 older DVD players sitting in the basement, they ALL read CDs but not DVDs. I always though it was because it had to work harder to read the DVDs since a DVD holds ~7x as much info in the same size space as a DVD, but I have read something about different wavelength lasers so maybe it does use 2 separate lasers, only looks like one when cleaning though....I'll defer to Mr. LS though. My DR-MX1S just started having the same problem as JDiane (i.e., it won't play DVD's - it shows No Disc in the display when I press the play button). Per LordSmurf's suggestion, I tried a pressed audio CD and it played it fine. Do you have any advice on how I can proceed to fix this problem? Do you think a cleaning would work and if so would you just try compressed air? I opened the unit, in anticipation that you would ask what drive is installed. 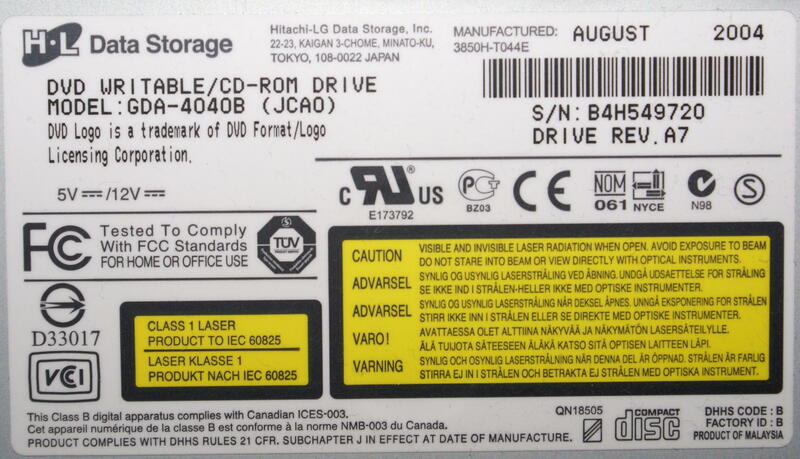 It's an LG GDA-4040B (I attached a picture of the label on top of the drive). Much searching has not found this drive for sale anywhere. I did find some other posts in this forum regarding people getting other drives to work in DR-MV units. However, the drives mentioned also are no longer available and I don't know if they would work in my DR-MX1S anyway.. I would greatly appreciate any advice you or others have to offer. Latest Update! Someone suggested to bring my machine to Best Buy to see if their Geek Squad can fix my machine. I honestly didn't think of them since I thought they only dealt with computers and if you bought it at their store. I was wrong; they did, at one time, sell my model. They work this way: I initially paid them a small $53 shipping fee. They try and diagnose the problem, they order a part (if they're able to), get my authorization, install the part. If, however, the part doesn't work I pay nothing, if it works I'm charged for the part. The part is a tad expensive $300, but as far as I'm concerned is if it indeed works and fixes my problem, I don't care! According to the technician, the money is for the part, labor and service but if the part doesn't work I pay nothing and I'm back where I started - with a machine with a dvd that doesn't work. What I'll do if this doesn't work, I have no clue. As of this past Thursday, they got my authorization to order a dvd part to try and install it. I'll know next week if that'll work. I hope, I hope, I hope. The dvd part inside my machine was Hitachi but when I went online to search for it all I got was reviews and not the model itself. I totally agree! I am sooo spoiled by my particular 3 in 1 that I refuse to settle. I did buy a Sylvania from ebay but the editing is dumb (delete a scene, it automatically goes back to the beginning of the show, you have to fast forward, delete another scene, then it goes back to the beginning again, etc; totally dumb to me) and you can only tape one channel at a time (I tape 3 shows during the day when I'm at work and I had to choose not to tape one show since it was on a different channel and the cable box had to be on the channel I wanted to tape - totally stupid, luckily my soap and Oprah are on the same channel; I'm a female don't laugh!). My JVC machine - Editing is done in a list format and I could tape as many channels as I wanted. Plus when you finalize a dvd it gives you a choice of background designs, unlike the Sylvania. I fixed a lot of DR-MX1S and it was usually the hard drive that was the problem. Very rarely was it the DVD Drive but occasionally that was the problem. Back then JVC was using a standard DVD burner, the same DVD burner that are used in computers, so you could have gone to Staples and bought any DVD drive and replaced it yourself. I installed 2 of the JVC drives in different computers and they worked perfectly. The only problem you would have is that JVC has different updates that the consumer cannot do themselves without the correct update discs and the service remote. So Best Buy is not going to refund your money if the DR-MX1S doesn't work after they fix it? They'll probably make you bring it back again and they will try to fix it again or they'll ship it to JVC to be fixed. I find it hard to believe that they'll just give you your money back so please update this thread to let us know what happens. Have you tried replacing the DVD with a current model LG (obviously IDE not SATA)? I don't think my problem is the hard drive because I can record and play shows from HDD and my DVD drive, like JDiane's does play pressed audio disks. Has anyone had any success replacing the DVD with a different LG model? I was able to find a GSA-4040B on ebay (mine is a GDA-4040B), but I'm not sure if it would be compatible. Does anyone know how they are different and whether it's worth trying the GSA drive? Thank you in advance for any help/insight you can provide.. I looked at it and my first thought was, "Oh, a normal, vintage-ish, IDE drive. I can use anything..." But it occurred to me that firmware differences will make replacement difficult or impossible. I can certainly try another drive--they're cheap--but I'm guessing right off the bat it won't work. Any tips? This is for a JVC DR-MV1SU. Copy DVDs on my DVD Recorder? Is it possible to finalize DVDs on another DVD recorder of the same brand? HELP! LG RH266 DVD Recorder won't play DVDs!